Transport of goods, whether raw materials or manufactured product, was the main reason for building most railways. When roads were inadequate and canals could not compete, railways carried goods quickly and cheaply. To-day, bulk freight remains an important traffic, offering environmental benefits over congested and polluting roads. To convey goods, railways need suitable wagons. Wagons can be owned by a railway company or by an industrial user, and travel throughout Great Britain as traffic requires. Our Core Collection wagons include Scottish-owned and Scottish-built wagons, along with others from English and British railways which were used in Scotland or demonstrate types or design issues also relevant in Scotland. 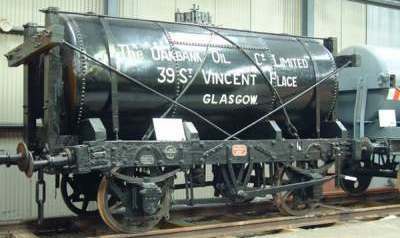 Goods wagons were developed from the vehicles that ran on the early colliery wagonways, which in turn owed their lineage to the horse drawn cart. The earliest Scottish wagonway was the Tranent to Cockenzie line (1722-1886), which was horse drawn with a gauge of 3ft 3in. The battle of Prestonpans in 1745 was fought around its main line. There was a great variety of wagon designs on the growing railway network, as the railways were legally obliged to carry any goods that were presented. Freight handling facilities and the physical constraints of the network led to the basic British wagon size being fixed about 1899-1900. Lack of development of network capacity coupled with the two World Wars stifled investment in larger wagons. By the early 1960s improved trunk roads and larger lorries had made major inroads into the railway freight markets. The railway responded by closing most of the local depots and modernising what remained. Increasingly, the emphasis would be on container traffic, bulk consignments, and fast long-distance freight services. The new breed of high-capacity railway wagons would be air-braked and capable of sustained speeds of up to 75 mph. The local freight train had had its day. Some things, however, do not change. Just as the main commodity transported on the first railways in Scotland - the wagonways - was coal, nearly 300 years later it is still coal that makes up 80% of the freight carried on the Scottish rail network. Click below to see the wagons of each type in our collections.